It’s true you can always buy frozen puff pastry at any grocery store. But, in less than the time it takes for the frozen puff pastry to thaw, you can make your own from scratch. I have a simple recipe I learned at L’Academie de Cuisine in Maryland, that is the one I turn to time and again. I just adapted it to make a larger quantity and also to give you a bit of a more detailed description. The key to making good puff pastry dough, or any flaky dough for that matter, is keeping everything very cold (well the flour and salt are fine at room temp!). You’ll want to cut your butter into chunks while being very cold. Begin by simply placing your flour and salt in the bowl of a food processor. Add your chunks of butter and pulse several times (about 10 times) until the butter chunks are reduced to pieces about the size of peas. Feel free to use your hands to feel the mixture to estimate the size of the butter pieces. Turn the crumbly dough out onto a lightly floured surface and carefully gather it together with your hands. Do not knead the dough, as we are actually trying not to form gluten strands. Puff pastry “puffs” due to a series of rolling, turning, and folding the dough. After you’ve gathered your dough into a single piece, lightly flour a rolling pin and roll it into a somewhat triangular shape. Now you’ll just turn the dough another quarter turn clockwise and repeat the whole rolling and folding process one more time. 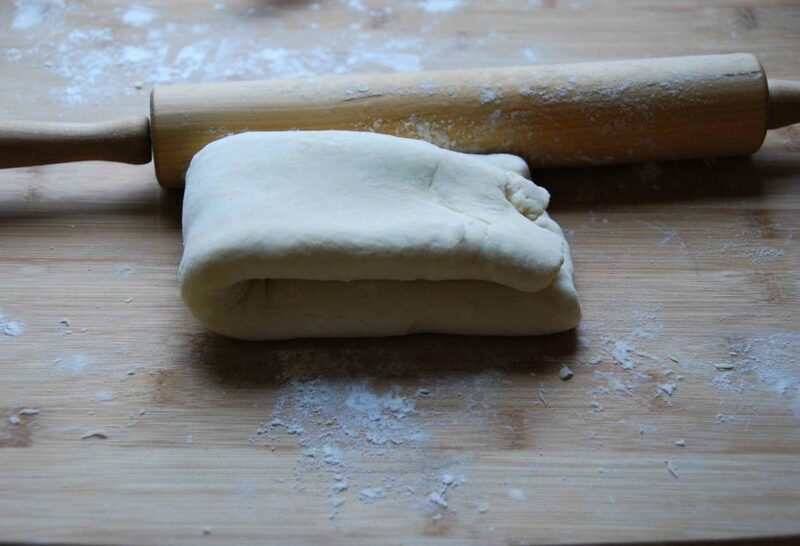 Triangle, fold, rectangle, fold, fold again: and you have homemade puff pastry! Wrap and refrigerate for at least 45 minutes and it’s ready to use. 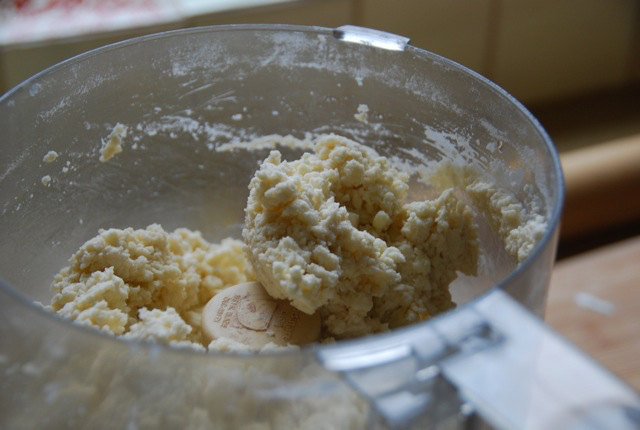 Place flour and salt into the bowl of a food processor. Add the chunks of butter and pulse a few times, until the butter is incorporated in large pieces (about the size of a pea). Slowly pour in the cold water while pulsing until a very crumbly dough is formed. Turn dough out onto a clean, lightly floured workspace and gently push it together with your hands – do not knead. Rolling and folding the dough: 1. 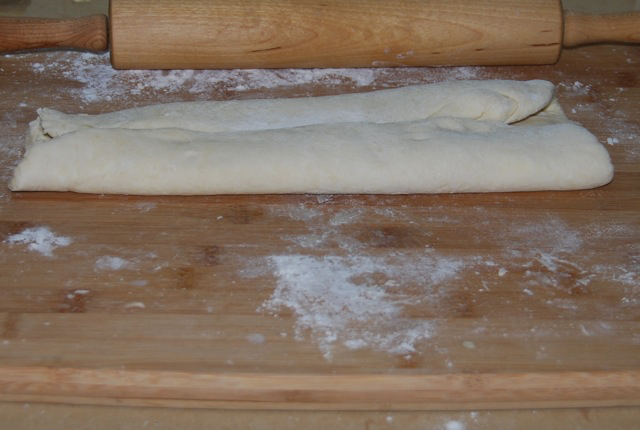 With a lightly floured rolling pin, roll out dough into a roughly triangular shape. Use your hands to fold the two bottom tips of the triangle inward and the top down, like an envelope. 2. 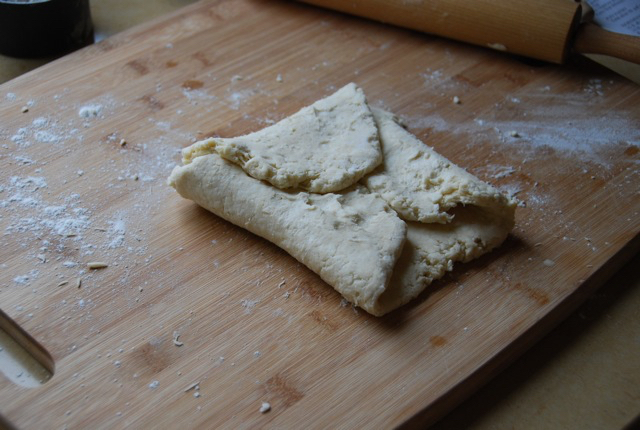 Turn the dough a quarter-turn clockwise and roll out, again, into a rectangle this time. Fold the two ends lengthwise into the middle to meet. Then fold the dough in half across. Turn the dough another quarter-turn clockwise, and repeat steps 1 and 2 above one more time, turning the dough a quarter-turn clockwise each time. Wrap the puff pastry in plastic wrap and refrigerate until ready to use. Refrigerate for at least 45 minutes before using. Pati, I can not find your recipe for Cinnamon Rolls, and your Pumpkin Seed crack Candy? Well, it is much better with butter, Cristelo. But if you try it with margarine and like it, let me know! I have always wanted to learn how to bake a few pieces of Pan Dulce, Campechanas are one of my favorites. I live in Kansas City, do you know of any place near that may teach classes. I will try your recipe, but I would love a hands on class to get it right. I’m not sure of any classes in your area…but I hope you enjoy the recipe, Lisa! Sure…or you can also use a knife to dice the butter into pea-sized pieces and combine everything by hand in a mixing bowl. PattiThis question is not about puff pastry, but about your recipe for the chocolate tres leche cake (sp) you made with almond flour and everything was put in blender. I cannot find that recipe anywhere. Please help. I live in Overland Park Kansas and would love to see all your shows. If and when I see you on T.V. I am so happy and want to see you everyday! I never know when you are on so when I by chance watch you it is a treat. For a while on PBS I new the time you came on and tried to watch but it changed. Thank you for this recipe for Puff Pastry it is one of my favorite to work with and enjoy. Do you have a recipe using whole grains? Hola Susan, Thank you so much for watching the show! You may try the puff pastry recipe using whole wheat flour. At a Mexican bakery in Zillah ,Washington I used to buy a rather plain pastry I liked very much. It was very flaky and the only filling was a little sugar and maybe a little cinnamon. It was folded up the size of a small envelope with multiple layers and was more like fillo than puff pastry. I can’t find this anywhere. I wonder if you have a name for it and maybe have a recipe. I asked at La Glorias in Bellingham WA and they seemed to recognize it and said they used to make and sell them, but they were not popular and were discontinued. I appreciate your site very much. Richard, I think it may be Morelianas if they were super crispy and crucnhy or Moños if they were soft. Will try to blog about them soon so I can test a recipe for you! I know this is a silly question, but I don’t have a food processor and was wondering if I could make this without one. Hi Sydney, Of course!! Dice the butter into pea-sized pieces with a knife and combine everything by hand in a mixing bowl. Patti!!!!! AMAZING RECIPE for puff pastry. It was a hit!! It was absolutely scrumptious! Thank you!!!! Gracias!!!! Ahora a superar la prueba maxima….hoy lo hare para mis suegros que nos visitan desde Argentina!!! Seguro que les va a encantar!!! Gracias mil!!!! G’day and thanks again Pati for “insipring” me to do! Without a good pastry, this apple pie would not taste the way it did and was devoured very quickly by hubby and friends too! G’day! I LOVED this recipe, TRUE! I have made Puff pastry before, but was ALWAYS “an effort” to do! Your recipe was “easy, peasy” and came out GREAT! This recipe I HIGHLY RECOMMEND as it is simply GREAT! I made Sugarless Pear Jam and Brie Puff Pastry Bites On A Stick; blog post will go LIVE our time tomorrow, TRUE! Hola justamente hace unos dias mi esposo me preguntaba si podia intentar hacer unos volovanes de atun. Ya ke somos de veracruz y como tu lo dijiste este tipo de comida es tipica de mi tierra. Asi ke esta receta me cayo como anillo al dedo. Solo ke tengo una duda. La masa para hacer croissants ke venden en el super es el mismo tipo de masa o es parecida a la ke preparaste. Espero ke me puedas contestar. Gracias. Nota: la verdad no tenia el gusto de conocerte pero con esta receta y la del pastel de tres leches la verdad me he convertido en una fanatica tuya. Saray: que bueno que me encontraste! La masa que yo uso es Hojaldre o Puff Pastry. La deben de tener en la parte del congelador del super, si no encuentras, si puedes usar de Croissant ya que es muy parecida y también te va a quedar riquísimo. soy de Monterrey y vivo ahorita en Iowa. Como vivo tan lejos de casa, el ver tu programa me trae muy bonitos recuerdos de nuestro hermoso país. Ayer prepare las empanaditas de masa de hojaldre y les encantaron a mis hijos y a mi esposo también! Te felicito! por tener un excelente programa de cocina. Hi MJ, Thank you so much for watching the show! The theme song “Dame” is by Domingo Siete; maybe you will be able to find him on I-tunes. I LOVE YOUR SHOW! I have always been a fan of watching cooking shows, and I,ve seen many chefs and cooks doing “Mexican Dishes”. As a true mexican I’ve always wondered, where or who taught them those recipes?, because they dont look like any I’ve ever eaten, until you came along, you have been the only one who truly cooks like an authentic mexican. I really enjoy all the history you teach us along with each recipe, muchas gracias,adios. Muchas gracias por escribirme Mayte! And so happy you like the show… I do pour my heart into each episode. I think I have fallen in love! I’ve made this puff pastry for the first time tonight and used leftover picadillo as filling…I’ve never had such a delicious dough as this. I’ve made many,many empanadas and tried many,many recipes for the dough, and this one is by far my favorite. Thank you so much for sharing this recipe with us! Butter costs a lot. How would substituting a solid shortening or lard work? If I use a differnt (and wetter filling) should I cut small vent holes in the top with a knife? I can’t wait to try this….i’ve always been intimidated by trying to make dough…your recipe looks easy…i will let you know. caio! Nothing to fear! Jump in!! Let me know how it turns out. Thank you Pati for all your nice recipes. They are explained and written so well and very easy to follow. I enjoy getting them in the mail. G’day! I came across your Hojalde recipe via email and can’t wait to try it! Will look to match it up with one of your other wonderful recipes too! Thank you! Thanks! It is a good take: super fluffy and puffy. Please return your show to Houston, Texas. I’ve not been able to access it the past couple of weeks, in the evenings. Thank you for the background/history of your recipes, and making authentic Mexican food with simple, easy explanations of the process. Good Mexican food is usually time intensive but you make it seem so simple. Thank you for your lovely comment Nila! Have you tried reaching out to your local station? Maybe they changed the time or are planning on running Series again sometime soon. Wait for Season 3 soon! Thank you for all you do & please keep it up. I enjoy Mexican food so much but after having the same menu at cafes I very much enjoy your new foods eaten by Mexico some I’ve never heard of until you came in my home.